Heirloom variety. Beautiful and delicious blue leaves with purple spines. 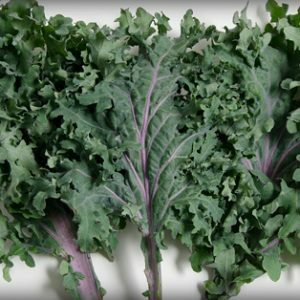 Hardy, resistant to diseases and much bigger in size than other kale varieties. Harvest baby or full-grown size leaves. Their taste is even better after frost. This variety entered Canada around 1885 with Russian traders. You may be more familiar with traditional round cabbages. But once you discover collard, there is no going back! A distinguished member of the Brassica family, collard is grown for its large leaves, less curly than kale. It can be used in a variety of ways : soups, salads, sautés, stews, pasta, juices, etc. Very nutritious, it is also an excellent source of calcium and iron. Easier to grow than cabbage, it is a vigorous green that can withstand frost. It will even be more tastier in the cold months. 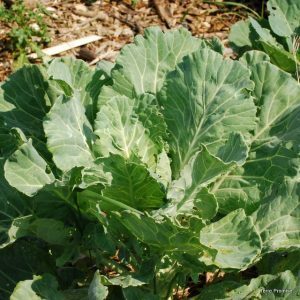 Tip : If you let collard overwinter in the garden, protected under a layer of mulch, you will harvest a provision of seeds in the following spring.